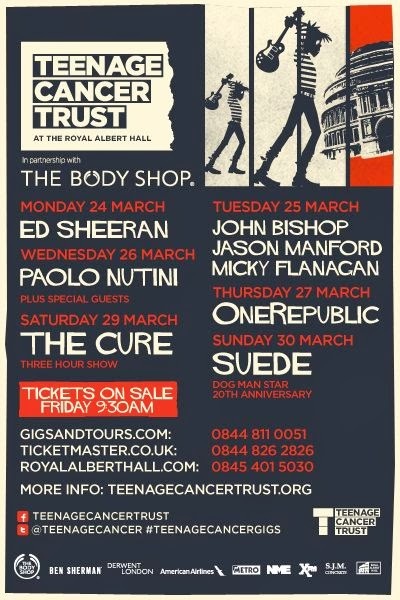 Seriously, I do not know where the time goes … It’s that time of year where The Body Shop gets their Corporate Social Responsibility hat on, and sponsors a series of gigs at The Royal Albert Hall to raise money for the Teenage Cancer Trust. This year they’ll be match-funding up to £30,000 worth of donations at the concerts. Last year, 2013, the series of concerts (which were curated by Noel Gallagher) raised upwards of £500,000 for charity which is a quite magnificent sum! And, from a person working in the charity sector, trust me, donations like this are simply NOT to be sniffed at. In the current climate, anything that brings in money will help charities do their jobs, and support people in need. I only wish my charity could do things like this! So, who do you fancy seeing? For me, it would have to be The Cure, or the Comedy Evening (I love a good comedy evening, I do). Maybe Suede. But mostly The Cure. Or the comedy evening … Anyhoo the gigs run from 24th to 30th March and the tickets go on sale this Friday 31st January. As an aside, I know it’s been quiet here recently, but there is good reason, honest! Also, there’s lots of great stuff going on behind the scenes which will make the quietness a thing of the past, so look out for an exciting announcement (or three) coming soon!